With Golden Arrow you can produce accurate results with confidence and in less time than almost any other method. 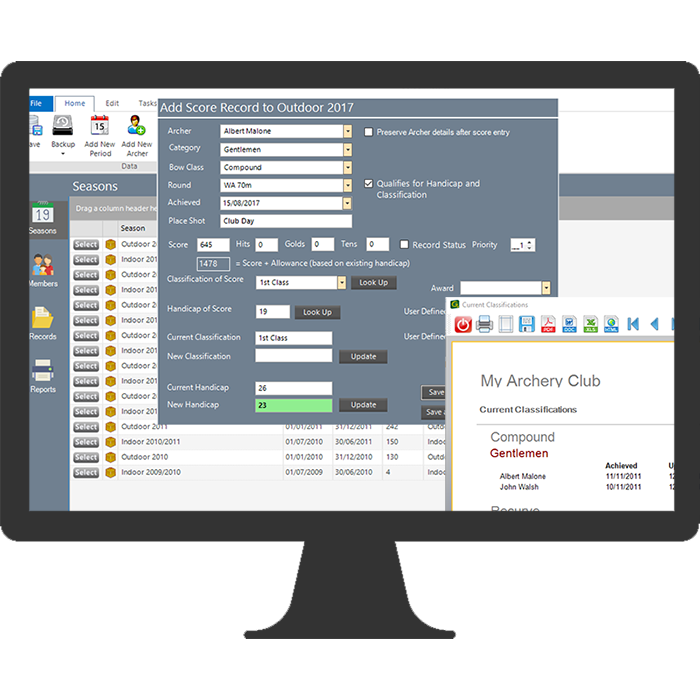 The “Quick Scoring” module in Golden Arrow allows score entry without needing to look archers up in tables or enter any other information. Provided the information in Golden Arrow is correct, the results will be correct. Golden Arrow is a flexible, adaptable and easy to use Archery competition scoring program. It can handle the whole process from setting up the target list to final results. There is no need to sort score sheets, they can be input in any order, as they are received. All you need is the unique ID number allocated to each Archer and their score data. It is quite possible to produce results for over a hundred archers before the equipment has been put away. Results can be viewed in a standard web browser (no internet connection required), printed or exported to spreadsheets or word processing packages. You can run Golden Arrow on two PC’s at once. The license allows it to be installed on a desktop PC for setting the competition up and on a laptop for scoring on the day. Golden Arrow will check if a target fee is due on checking in, and changes can be made easily if archers want to shoot a different bow etc. As scores are entered they are validated against maximum score, hits etc for the round and logic checks such as number of golds not exceeding number of hits are made. There are only two sources of error with Golden Arrow – either the archer has not added up the score correctly, or in entering the data a mistake has been made (eg 556 entered as 565) – unfortunately Golden Arrow can’t help with this! 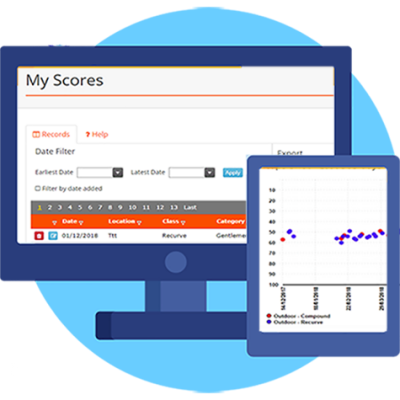 Leaderboard Scoring – Run a leaderboard either by adding scores for each interval to the previous total or by entering a new total. Couples Scoring – Automatically computes scores for couples. Teams – Golden Arrow computes team results according to user defined rules. Number in a team, who is included and who is excluded is all configurable – the program does the rest…. Now handles teams of variable size you set a minimum and maximum number. Multiple Rounds – Scoring a competition with 1, 2, or more rounds being shot is easy. Enter the score for each round and Golden Arrow will total them, average them or take the best one and output perfect results. Home and Away – If in addition to open results you want to produce results for Home and Visitors this is easily done by simply adding the relevant categories and using them or not in result computation. Easy Target Allocation – Archers can be assigned to targets using the Target Map feature to drag and drop archers. The Target map makes it easy to check that targets are not over-crowded and that archers from the same club are split up. The target allocations are automatically taken forward into the Target List. Pre-Competition – As entries come in you enter them in the relevant tables along with if payment has been received or not. Data such as membership number etc can also be recorded, along with notes such as a trophy to be returned. This information is available at check in, either using a printed sheet or using Golden Arrow. 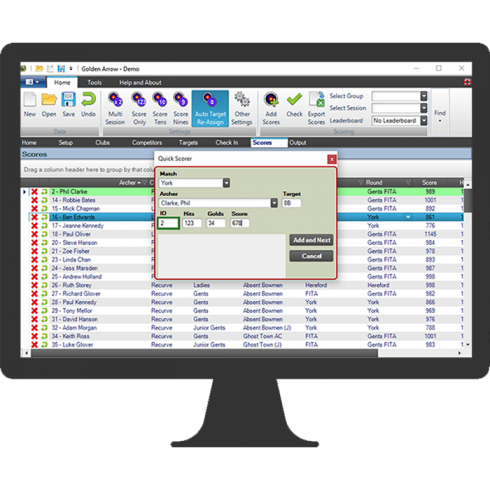 Producing Results – Results are produced by simply selecting the required format. Sort order, visible columns, grouping of results are all user selectable. Now with a much improved report creating system with extensive customisation, saved reports and more. Built in export to PDF, Word, Excel, HTML. 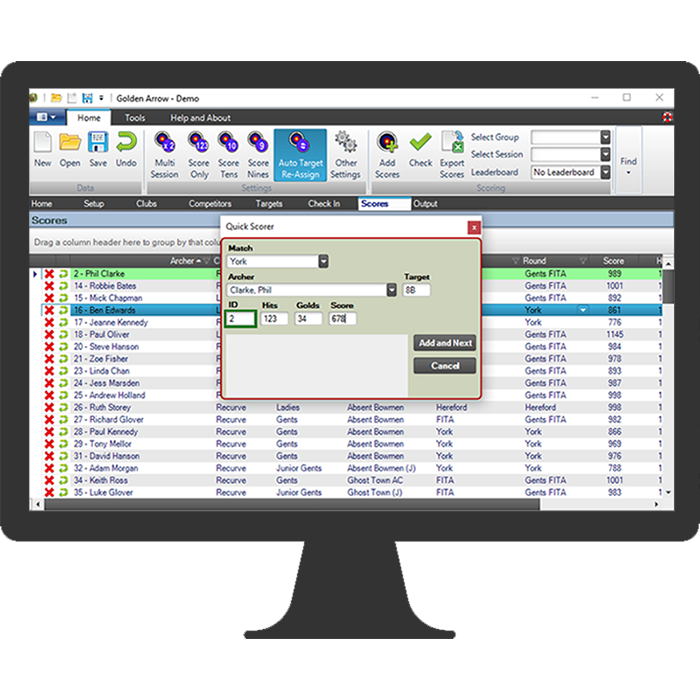 Result Format – Results can be grouped by up to 4 (minimum 1) group levels. Typically these would be Group (eg York), Section (eg Ladies), Class (eg Compound) but they can be set in any order. Download and install the program you want to try. It will operate fully functional for 30 days. After 30 days it will stop working unless a purchased serial code is entered to unlock the program.